Resources: Chapter podcast and YouTube videos. Play the chapter podcast on your PC or Mac using iTunes. For mobile playback use an iPhone or iPod touch. Course management tools such as ANGEL's Course Syndication or Blackboard's Manage Podcast allow instructors to deliver audio-formatted course materials to their students. Although creating, optimizing, and tagging these audio recordings require planning and preparation, the actual process of creating a course podcast requires just a few basic steps. Students subscribe to the podcasts, typically with iTunes, and organize them in their personal music library for listening on their PC or Mac. Subsequently uploaded episodes (recordings) are automatically delivered to iTunes, even if students are not logged into your course. Audio podcasts are familiar to most everyone; however, enhancing podcasts with timed images, chapter markers, web site links, and text over audio is less well known. Yet these enhanced podcasts offer promising online, assisted, and mobile learning alternatives that traditional audio podcasts do not easily provide. 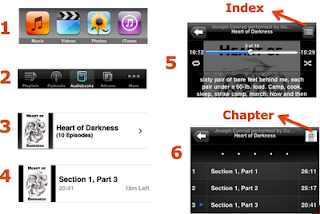 When formatted for mobile learning on devices such as iPods and iPhones, enhanced podcasts and audiobooks engage students in new, unique, and exciting ways. Join me in this session as we look at and listen to enhanced podcasts and custom audiobooks, including text-to-speech for assisted learning. Software solutions that create these special materials will be demonstrated including converting PowerPoint presentations into audio-enhanced lectures.